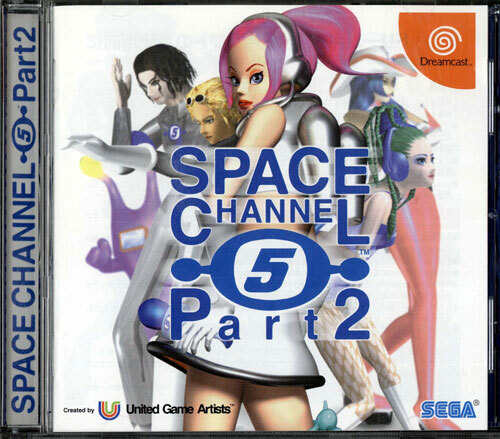 Ulala once again bust's a groove whilst looking fab in her futuristic attire in this Sega Direct exclusive. A great addition over the prequel is the two player co-operative mode which sees control of Ulala split with one player taking the direction pad, the other the buttons and frequent off screen scraps as to who was at fault for the missed hip gyration. Look out for a guest appearance from Michael Jackson on one of the stages, but his moves suffer in comparison to our Ulala. Second hand. Pack comes with Space Silver headphones fitted with the fluffy white ear muffs plus seemingly unopened black ear covers and seemingly unopened Galaxy Bag. Comes with Space Channel 5 Alarm Clock - first time we have seen this - in a box with sealed bag. Scratching to inner circle of the disk. Complete with spine and registration cards. Slight box crease on the lid.